Who is actually a member of the FNSA? All self-identified Aboriginal, First Nations, Inuit, Métis, and Status/Non-Status students here at SFU. The First Nations Student Association is an independent student-run organization and it is not a department of SFU and is not connected to student services at all. We have no employees and all the work we do is done by students for students. What does the FNSA do for the students here at SFU? And for which students, just First Nations or everybody? Our mandate is two-fold: to personally, academically, and culturally support self-identified First Nations students (Inuit, Métis, Status and Non-Status) and to educate the campus community on First Nations issues. We are here for all students in one capacity or another. All of our lectures and speaker series are open to the entire student body here at SFU as well as the community at large. In the past we have also advocated for services and resources for students and the promotion and sponsorship of activities on campus that demonstrate the cultural diversity of First Nations people.Every year we have a feast open to all of SFU to celebrate our culture called the Spring Feast. At this event there are traditional dancers, performers, artisans and craftsmen sharing their culture with the students. What does the FNSA have to offer First Nations students (Inuit, Métis, Status and Non-Status)? The FNSA attempts to create a greater sense of community by providing a space Indigenous students are free to be themselves and meet other Indigenous students that may also be far from home. We also hold socials, be it lunches, dinners and get togethers to help bond students. Many skills are needed to be successful, not just academic ones. Many students need to build their resumes and we host training sessions that will benefit them outside of SFU. Last year we ran a FoodSafe, First Aid and Board Training sessions to improve upon their employable skills. As a way to introduce the Learning commons workshops to the students a special session is held for Indigenous students at the FNSA's expense to help the students learn effective study habits and how to best prepare for exams. Many of the First year members are from smaller colleges and need help adjusting to SFU demanding schedules and work load having other Indigenous students to lean on and gain advice from helps the students survive their first terms. The FNSA also hosts large events around the interests and in the field of study of the students in the FNSA that will help them gain networks outside of SFU. Over the past year FNSA has hosted numerous drum making and medicine wheel workshops to help the students gain experience in the many cultures of First Nations in this country. We have also provided a home for the Coast Salish singing group to promote the students learn the art of singing while here in Coast Salish territory. All of our events and meetings are catered by an Indigenous Catering company that can provide traditional food for the students. 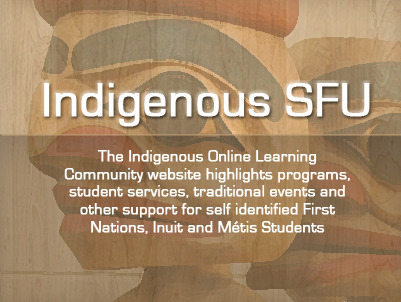 What does the FNSA have to offer a Non-First Nations person here at SFU? What are some of the FNSA hosted and funded events this past year? Where is the "I" in Reconciliation with Marie Wilson, Commissioner for the Truth and Reconciliation Commission of Canada, discussed the progress of the TRC to date and the problem of reconciliation between Indigenous peoples and European settlers following decades of forced residential schooling of Aboriginal children. A Residential School Symposium: Dr. Eldon Yellowhorn, Chair of the First Nations Studies Department led a presentation concerning the overall history and legacy of residential schools. A panel of residential school survivors/attendees provided their input concerning their residential school experiences. A Site for Reconciliation: Continuing Neglect, Residential Education and Child Welfare: Dr. John Milloy, professor of Canadian and Indigenous History at Trent University in Ontario, has done research for the Royal Commission on Aboriginal Peoples, the TRC, and is the author of A National Crime: The Canadian Government and the Residential School System, 1879 to 1986. With both the Spring feast and Idle No More happening within a week from each other the FNSA members were extremely busy as 2000 students attended the feast and news crews, community members and politicians were up on the mountain for our collaborated Idle No More event. As a team building event the FNSA had a partnership with SFU food bank to recreate our logo in cans. The cans were then divided up between the foodbank and the Aboriginal Friendship center to feed the needy. A partnership with the Women's centre resulted in an evening of dialogue around women surviving domestic violence in Red Reasoning with Annie Ross, Joyce Fossella, Cease Wyss speaking and a Halloween event for SFU student with children this past year. This Summer the FNSA funded the SFU Indigenous Honoring feast held at the Diamond Alumni club. This annual event is collaborated with committee members from many departments of the University and the FNSA holds a seat on their committee to help with not only funding but the organization of the event.